The current 3-year study is funded by the Nebraska Environmental Trust. The goal of the study is to better understand sand bar formation processes and general areas where sandbars of suitable size for habitat of Least Terns and Piping Plovers. In 2011, the LPRCA in partnership with the Lower Platte South NRD funded a 1-year pilot sandbar monitoring study from Salt Creek to Highway 75 with USGS and in partnership with the Tern & Plover Partnership. 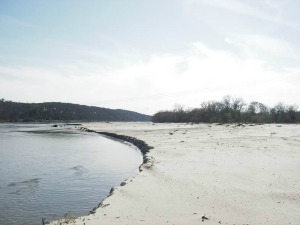 The goal of the one-year pilot study was to identify the following characteristics of sandbars on the lower Platte River: frequency/abundance, location, area, height, bank attachment, and vegetation density through three separate surveys. In addition time lapse cameras at various points have been used to observe more frequent changes and correlate river stages to sandbar frequency and size. Most of the data related to the characteristics has been collected only on bars 2.0 acres or larger in size with the exception of frequency/abundance and location. Sandbars of two acres or larger are generally considered to be what is needed for tern and plover nesting habitat. The initial survey was conducted following "ice-off" in April/early May, the second survey was during the high flow period in late June/July and the final survey was at low flow in the fall. Currently the project continues to include annual surveys of the entire 103 river miles of the lower Platte River. Additionally eight timelapse cameras have been placed at locations to assist in better understanding short-term and long-term changes in sand bars, as well as flow and ice conditions. The images from these cameras are shared jointly with the Platte Basin Timelapse project. The project will continue with targeted surveys following the usual high spring flows. A report for the 2011 study can be found on our Publications page. Additional reports will be coming soon.